So it may or may not have happened again, but I am in a manicure funk. I'm feeling unoriginal, bored, and just horrible at what I do. I'm sure it is a mind over matter thing, but seriously what designs have yet to be done. I feel bad when I cannot come up with something original and I just copy other's manicures. I want to bring you guys original content, but alas, I don't. In the end though, I do sometimes put my own spin on things, and well my art doesn't look 100% identical, but still. The night I painted these puppies I was feeling horribly unoriginal. I was trying to attempt cartoon nails, you know those awesome boardered nails with the pink in the middle. I'm too lazy to insert a link to them so you'll have to Google lol. 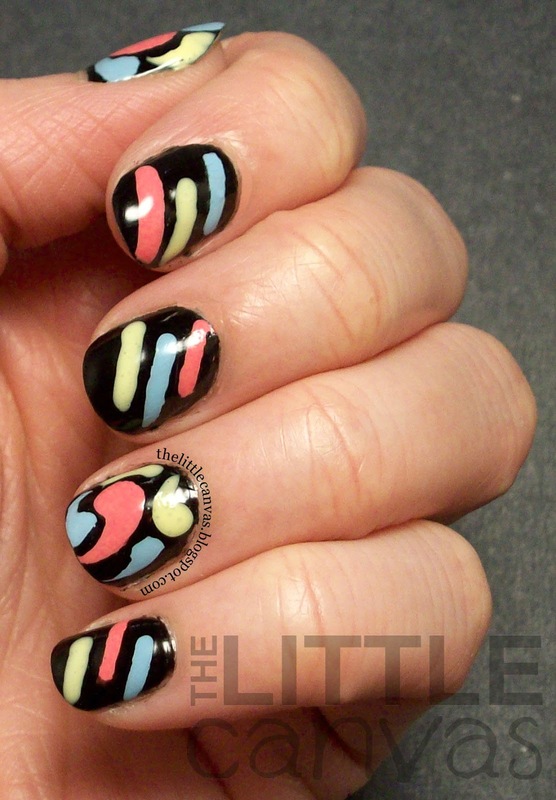 Well, the girl who originally did them has awesome square shaped nails. I however do not, therefore they looked HORRIBLE on me. 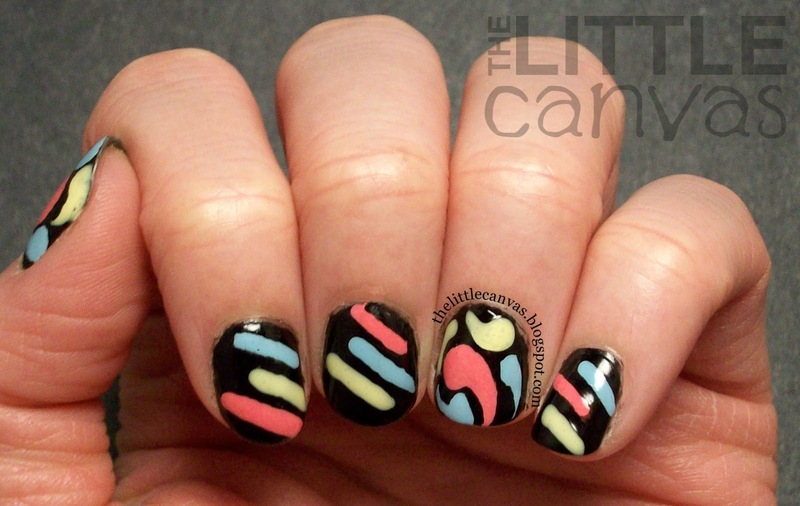 Since my nails were stained black from the polish, I decided to attempt these nails by SupaNails. Cool looking, right? 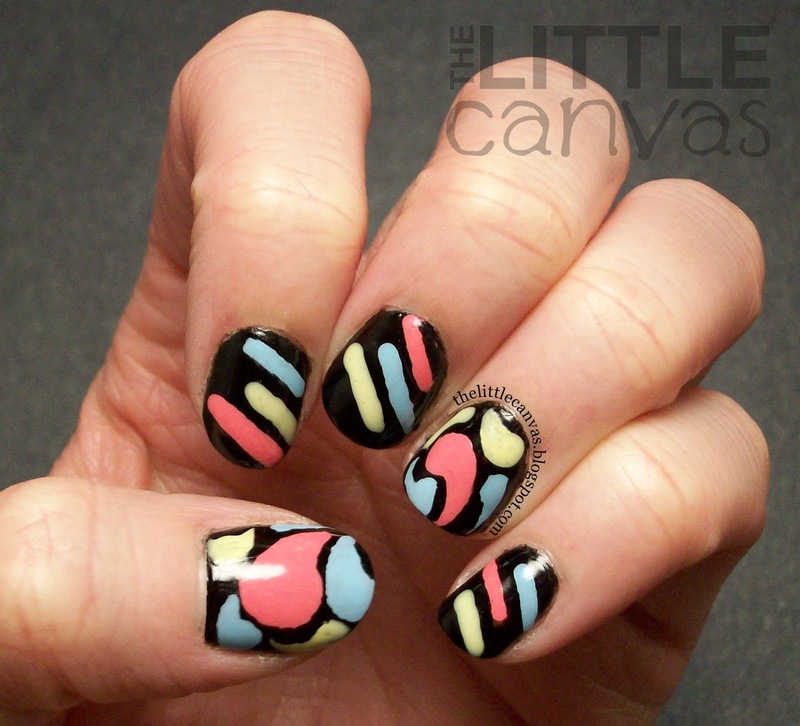 I put my own twist on them only accenting two of the nails with the bubbles. I wasn't really feeling them, but I recieved many compliments from customers at work. My manager told me they looked "jazzy," thus the name "Jazzy Nail Art." When I found these nails, I was talking with Kylie from SparKylie Nails who deiced to attempt them as well. 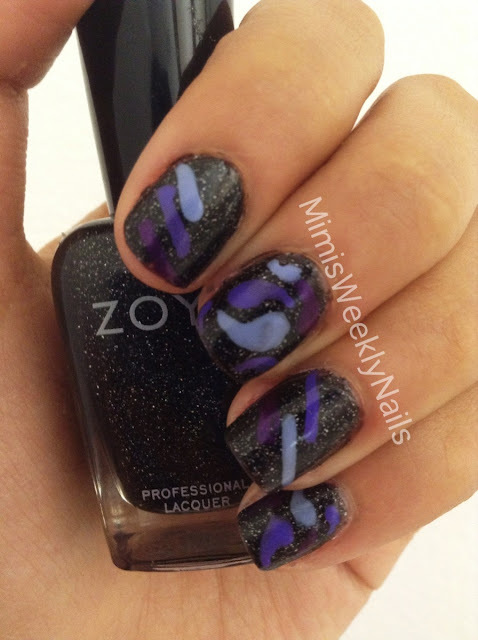 The talented Mimi from Mimi's Weekly Nails joined in on the fun also! After my rambling, you can see their pictures as well as part of this Triplet Nail Post!!!! I love sharing posts with other artists!!! Let's take a look!!! To get the look, I started off with a base coat of the most perfect black polish in the world, Orly Liquid Vinyl. When dried, I detailed on the swirly design and the lines. I'm kind of mad that on my middle finger and ring finger I messed up and put the yellow line on the bottom. It should have been the top color and the blue should have been on the bottom on the pinkie. Grr, sigh, oh well. This is probably one of those things only I noticed and no one else did until I just said something. Here are Miss Kylie's nails! Love, love, love how hers came out! Her design more closely resembles SupaNails and I'm kind of wishing I did what she did. Loveeeeee. Miss Mimi's Nails are below! The fact that she used Zoya Storm and all purples is a win over mine any day. I cannot begin to say how much I love these!!!!! I wish I thought of using storm and being creative with the colors instead of trying to copy the scheme of SupaNails. So talented. Kylie was the one who told me Mimi wanted to participate and I'm so happy she did! I found a new, amazing nail artist!!! I may need to start doing more of these "twinsie" posts! Thank you, Mimi!!!! What do you think of all of our manicures??? Are you a fan of the twinsie/triplet posts?? Thanks to Kylie and Mimi for making this post not so boring, and keeping me continually inspired despite these random manicure funks!!!! Until next time, <3. I love the nails you did. I like the colors yours better than just the purples since they really pop more and are more in your face. The purples are pretty too, but much more subdued and conservative. I have to agree, the purple are more for a, shall we say work appropriate situation? This is pretty, I love your color choices. thank you so much. I'm happy I picked the ones I did over some of the colors I had out at the time.